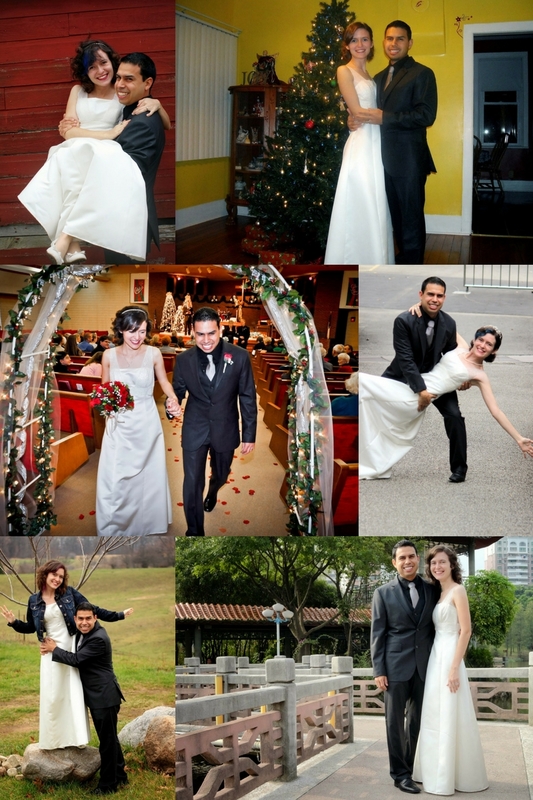 The Random Writings of Rachel: One Dress, One Suit, Six Years. All combined into one high-tech collage. Crazy how advanced technology is these days. I'll leave you to guess what years they are from top left all the way around clockwise, since they're entirely out of order. No fair if you look back at blog posts from past years to get the answer right/see the larger photos. Photo credit to sister Rebekah, it's the second year she's taken anniversary photos for us! A getaway was much desired after this year, and I'm so happy we booked 2 nights at a REAL HOTEL on another island not too far from home, but just far enough. I've banned laptops from coming along with us on the trip, but I'll probably instagram a bit along the way. Year six is the year for the "candy" gift, which is the easiest year ever since Angel's favorite thing is Kit-Kats. I love our annual 'photoshoot'--when we got married, we had a professional photographer, in the years since, twice we have propped up our camera and started the self-timer, and 4 times we've had one of my siblings take the photo. It's so practical to have so many siblings. What traditions do you have for anniversaries? Happy anniversary, girlie! I love that you guys take these photos every year!!! Happy Anniversary! Such a fun tradition. I adore this tradition!! I wish I had thought of putting on my wedding dress every year. It's just sitting in a box. I love that you get to wear it over and over again. We do anniversary photos as well and it's so much fun to be able to look back on them. We try to get a little getaway for our anniversary too. It didn't work out this year with moving and Nick's busy new job, but there is always next year. Aww, happy anniversary, such a lovely tradition this is, and you guys look incredibly adorable in these pictures. Beautiful pictures! Love the tradition! This is such a cute idea! You guys look great! Happy anniversary! Oh my goodness, this is AWESOME! I'm going to be about 39 weeks pregnant on our first anniversary, so something tells me I *might* not be able to fit into my dress! ;) But I am super excited to start fun traditions with my husband! Happy anniversary! Enjoy the getaway! That is a great tradition! I had hoped to wear my wedding dress for our 10th year anniversary, but my dress fit me like a glove when we got married and 3 children later, I didn't fit into anymore. Happy Anniversary! This is such a great tradition. It's a shame that the dress we love so much sits in a box for the rest of it's life. A few years back I took my kids to the spot we took our pictures and had them recreate our poses. It came out so sweet when we put them side to side. So far, for our wedding anniversaries we've been throwing ourselves themed parties-we had a Star Wars party once, an Avatar: The Last Airbender party, and a world-cultures-Civilization V-themed party. I don't know if we'll keep the themed party tradition up, but I want to, because it's so much fun and I like it a lot more than just going out to a random restaurant (though that's fun, too). Aww, I love this! Happy anniversary!! I like your tradition of taking a picture in your dress every year. That is really fun. Dave and I haven't been in one spot long enough but if we are in Wichita we try and ride our bikes to a sushi shop that we went to on one of our first dates. I had two wedding dresses and actually sold on one ebay. =) The other ones hangs in my closet. I should probably wear it sometime.